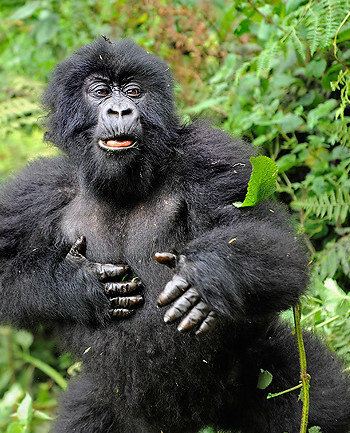 Gorillas in Uganda are very popular tourist attraction, and gorilla trekking one of the most popular tourist activity. They are an endangered species that is being kept alive by the dollars that the tourists pay to see them. Communities in gorilla areas are protective of them because they contribute to their livelihood in one way or another. The gorillas in Uganda are protected by the economic lifeline they create for remote communities from the tourist revenue they generate, providing a key incentive for humans to protect the giant animals. Bwindi impenetrable forest found in south western Uganda is home to about 400 mountain gorillas which is pretty much half of the entire world’s population of mountain gorillas. This explains the tourist traffic to the southwest of Uganda, and the growing demand of gorilla tracking trips in Uganda. But these animals as amazing as they are to view are regularly hunted for meat, and by some farmers to protect their crops. The income from tourism is therefore used to protect them to ensure that their population and also that they stay alive to earn the tourism industry more revenues. “Tourism started as a way of showing the people that gorillas can be economically important, that we can earn revenue which can improve your livelihood”, says Charles Tumwesigye the deputy head of conservation for the government’s Ugandan Wildlife Authority. So the economic relevance of the gorillas is what is keeping them alive and protected. The privilege of catching sight of these gorillas or taking a gorilla trekking trip comes at a high price though. A single visit costs about $600. But many tourists do not mind paying that much money mostly because they know that the income goes to preserving the species. Although threats to the gorilla populations such as war, habitat destruction and disease were once expected to end the existence of the species before the 20th century, the population has grown by about 30% in recent years. Experts however are warning that exploitation of natural resources in Africa and Asia is a major danger to the apes because most of these activities destroy their habitat. Uganda, Rwanda and DRC are the only countries in the world where you can see the giant primates. This is why tourism in these countries is growing. The communities in around these mountain gorilla habitats are also benefitting, setting up lodges for tourists and selling their merchandise which provides an incentive for them to protect the species.